RF|Binder is dedicated to providing a culture for our staff that allows them to make a positive contribution to their communities. RF|Binder is dedicated to providing a culture for our staff that allows them to make a positive contribution to their communities. As part of this commitment, RF|Binder created RF|B Cares, a year-long volunteerism and community service initiative where we come together to volunteer our time and resources to various nonprofit organizations and charities. Past activities have included food drives, volunteering at soup kitchens, working with children's charities, and participating in walks to raise money for various causes. 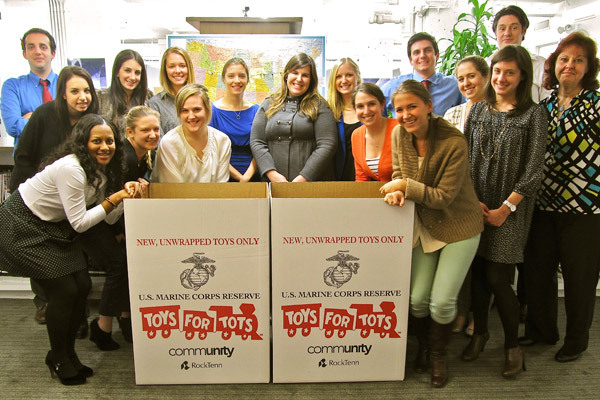 As part of our annual holiday giving efforts, RF|B Cares is hosting a toy drive through the US Marine Corps Reserve Toys for Tots Program. The agency is collecting unwrapped new toys to deliver to children in need in New York City. This year, we've expanded our holiday campaign to support the victims of Hurricane Sandy. In place of our traditional holiday gift for clients, vendors, and friends of the agency, RF|Binder will be making a donation to a disaster relief organization in their name. In addition, RF|Binder has joined A Billion + Change, a unique national campaign that seeks to mobilize billions of dollars of pro bono and skills-based volunteer services from corporate America to support nonprofit organizations.